t*rexes and tiaras: Cocktails and Presents.. It's only the 5th, but already New Year's Eve feels like a really long time ago. On the other hand, I'm not sure I'm quite on top of which day it is yet. Eep. I have to admit, I wasn't really feeling in much of a party mood when it came to New Year. 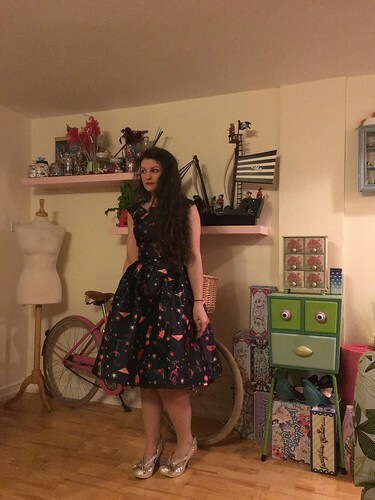 Feeling pretty down, I was very tempted to just hibernate in my duvet fort with a movie and my knitting, but in the end I was persuaded to head to a friend's party. I knew what I was going to wear, if I was brave enough to go out. 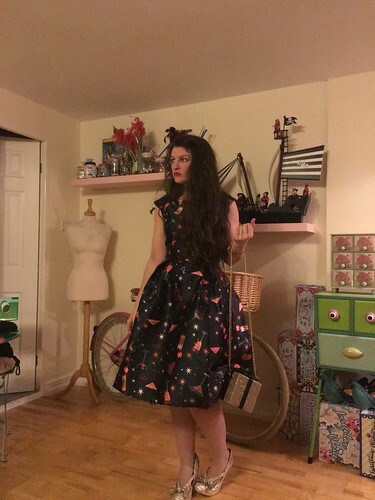 This cocktail print Odette dress was one of the first things I ordered from Joanie Clothing, which has fast become one of my absolute favourite websites. (It's currently in the sale for just £15 if you're wanting one!) The print is just perfect for parties and I love the scalloped neckline. The other thing I'd been saving for a special occasion was this gift box bag - Also from Joanie Clothing and currently on sale(! ), it's got a detachable chain handle, and closes with a secure popper. It's a decent size for all of the party essentials (which in my mind are coin purse, keys, lipbalm and phone). I teamed them with my Irregular Choice Curtain Call heels. It was probably the best idea to get out and I had a lovely evening with friends, even if I wasn't really feeling it. How did you see in the new year? That sounds like a lovely way to spend New Year. I did have a nice time in the end, I just wasn't really feeling in a very party mood. So glad you had a good time. You looked fantastic.